25 Simple Christmas Traditions to Embrace This Christmas - So Festive! 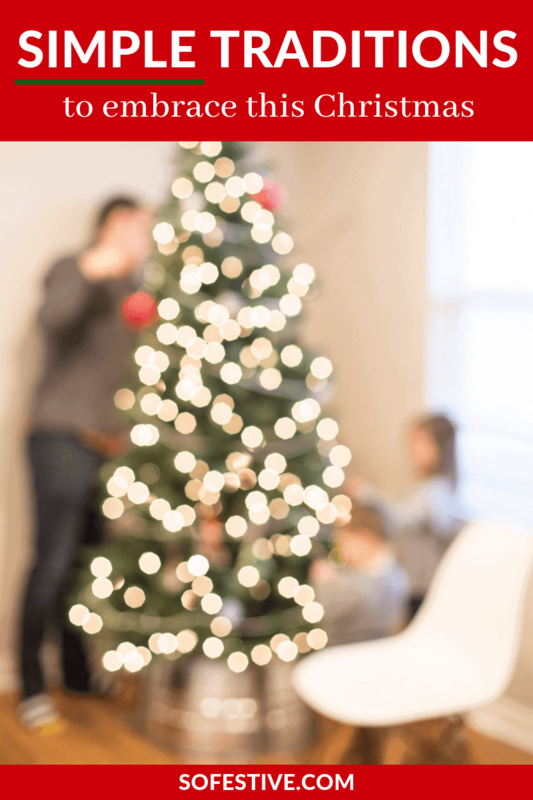 Have a more meaningful Christmas season by embracing these simple family Christmas traditions. For years now, we’ve been trying to simplify our Christmas more and more. We simplify our Christmas season by giving less gifts, focusing on Christ with Christ-Centered Christmas traditions, have our shopping done early, keeping our decorations to a minimum, and other ways as I teach in our “Simplify Your Christmas” online, self-paced workshop. Don’t get me wrong. We are far from perfect and some years are more simple than others. It’s easy to get caught up in the fun Christmas activities that only happen during December. Why can’t we have 60 days between Thanksgiving and Christmas? But we’ve learned that when we slow down and take the time to enjoy the calmer, simpler moments the season brings, we are ALL happier. And isn’t that what Christmas is about? Last Christmas, I learned this lesson again. On December 23, my husband and my Alma Mater was playing a basketball game. Go Cougars! He really wanted to take our entire family to the game and invites cousins to go along, too. Well after I let myself cool down a bit, I realized that Christmas is not about WHAT we do per se, but the memories we are creating. So I gave in (with only a slight grudge) and we spent the night at the basketball game. We listened to Christmas music for an hour in the car, had a really great chat together, and got to make some fun memories with our extended family. So why do I tell you this? I learned that YES! Christmas activities are fun and meaningful, but let’s not forget the WHY behind what we are doing. If everyone is unhappy doing a really fun, festive Christmas outing, is it that important? Of course, this will look different for every person and every family. And it may take some time to figure out how to find a good balance. Before December starts, sit down with everyone in your family and prioritize the most important activities and events for everyone. Let everyone choose one or more must-do Christmas activities/traditions. Mark them on your calendar. For more planning tips, join the online “Simplify Your Christmas” workshop here. 1. Decorate the Christmas Tree together. 2. Watch the Christmas Devotional from The Church of Jesus Christ of Latter-Day Saints. 3. Read Christmas stories under the Christmas tree. 4. Have an indoor picnic by the Christmas tree. 5. Drive to see Christmas lights in pajamas. 6. Drink hot cocoa on the front porch. 7. Cuddle up to a Christmas movie. 8. Sleep out by the Christmas tree on December 23. 10. Have a candlelight dinner. 11. Dance to Christmas music. 12. Deliver the 12 Days of Christmas to someone. 13. Be disconnected to enjoy time with those you love. 16. Visit someone in a hospital or rest home. 17. Hand out candy canes to visitors. 20. Try out a new Christmas recipe. 24. Go to a movie together on Christmas Eve. 6 Awesome Family Halloween Costume Ideas For Under $30! !